190 pages | 22 B/W Illus. "The importance of this book extends beyond transboundary water and the developing world to bring intelligent insights to many water issues. Naho Mirumachi critically examines a number of shibboleths in water management such as: conflict and cooperation are opposites; agreement means decisions are equitable; templates like the creation of strong river basin organization structures leads to better decisions; and increasing resources for the hydrocracy serves the public interest. This is the best book about water I have read in a long time." – Helen Ingram, The Southwest Center, University of Arizona and Professor Emeritus, University of California at Irvine, USA. 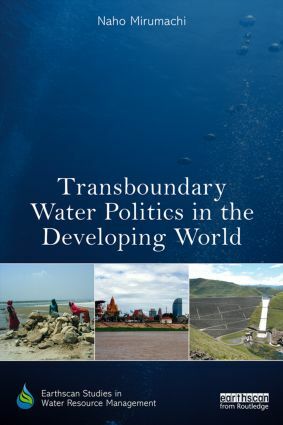 "Transboundary Water Politics in the Developing World brings insight and nuance to a field of inquiry dominated by speculation and generalisation. We often hear that wars of the future will be fought over water by states locked in competition for a shared but increasingly scarce commodity. But we are also told that it is far more common for states to cooperate than it is for them to conflict over transboundary waters. Applying a rich theoretical framework dubbed 'TWINS' – the transboundary waters interaction nexus – to three case studies, Naho Mirumachi sheds new light not only in terms of her cases – the Mekong, Ganges-Brahmaputra, and Orange-Senqu river basins – but in terms of what we know and what we can expect from transboundary water politics. This is a must-read for all those interested in the complex ways a multiplicity of actors, forces and factors come together in the simultaneously conflictful and cooperative world of water resources development and management." – Larry A. Swatuk, University of Waterloo, Canada. "Naho Mirumachi’s new book is a comprehensive and rigorous work on the complex world of transboundary water politics and will interest both academics and water sector professionals… This is an important contribution to water management practitioners and researchers, especially those working in developing countries." - Kyungmee Kim, Uppsala University, Sweden, in Water International (2016).